A new general election opinion poll from Gezici Araştırma appeared in Vatan on Wednesday. The headline figures with changes from their last survey in January are AKP 43.0 (-2.7), CHP 28.0 (+1.1), MHP 18.2 (+0.3), BDP 8.1 (+2.6). I haven’t seen full tables of the research, but Vatan’s commentary suggests the AK Party lost most of its support in western and central regions, where as the CHP and MHP. The fieldwork was done over the weekend of 23-24 February, which would place it at a time when negotiations with PKK leader Abdullah Öcalan was prominent in news coverage. Gezici have been showing a shallow downward trend in the governing AK Party’s support since November. The main beneficiary has been the CHP, shown as up by nearly two percentage points over the last three months. That’s a healthy AK majority of 40 seats – so no real change to the shape of power. Gezici also polled voting intention for next year’s local elections (changes from January): AKP 38.6 (-1.2), CHP 28.6 (-0.9), MHP 19.8 (+1.4), BDP 7.6 (+1.1). 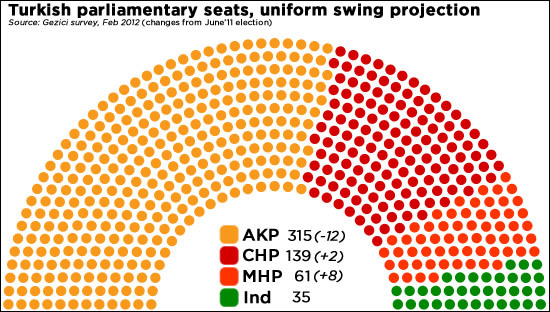 It suggests trouble is afoot for AK Party councils, but national results based on local election questions will invariably be affected by where in the country people were polled.